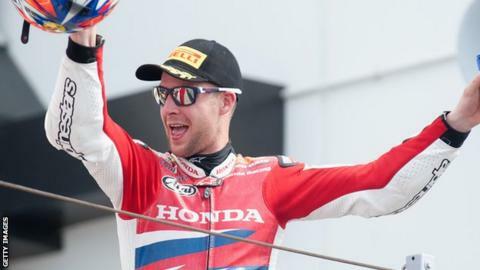 World Superbike rider Jonathan Rea has signed with Honda for a sixth season. The Northern Ireland rider will be joined by Englishman Leon Haslam who will move from BMW for the 2013 World Superbike campaign. Rea recently replaced the injured Casey Stoner in the Repsol Honda team for the MotoGP race in Misano and will do so again at Aragon on 30 September. Haslam will line up sixth on the grid for Saturday's World Superbike races at Portimao, one place ahead of Rea. "I have been loyal to Honda my whole career and I believe we can achieve more together in the future," said Rea, who is from Ballyclare in Co Antrim and now lives in the Isle of Man. "We have been lacking in certain areas but there is a team of determined and dedicated guys working away at the races and at the workshop to improve the bike and to try to be a consistent front runner next season. "They have got some exciting plans for 2013 and beyond."